WuJi Gong (Primordial Tai Chi) the bridge between personal Love Qi in our hearts and the universal Love Qi flowing in the heart of Dao. In the Daoist [Taoist] view, our Cosmos is a living, conscious, pulsating energy field. Its aliveness is defined by its many frequencies of harmonious flowing Qi, the "subtle breaths" of this vast organism. All beings are cells of this yin-yang pulsating organism. Qi is popularly known as "life force" in the West. Star War's use of the term "The Force" was inspired by Daoism. Dao ("natural Way") is inherently good. This goodness arises and flows through the cosmic Qi field. The Qi field never loses its equilibrium, which makes balance and harmony the Highest Good of Daoism. Qi is the universal source and medium for nourishing what ever evolves a higher level of harmony and balance, regardless of its outer "face" as religion, science, politics, whether human or alien, personal or impersonal. Dao loves everything and every being that exists by supporting it with Qi. All dimensions are filled with Qi; there is no energetic emptiness. No Qi = non-existence. Only wuji remains unknowable. Qi flows into a physical dimension called Nature, or the Body of the Dao. Dao embodies itself by what Lao Tzu in the Tao Te Ching [Daode Jing] calls the "self-arising" (ziran). "It is self-so!" his classic text says repeatedly. Dao loves its spontaneous, self-creating process, in which energy arises from source, takes spiritual and material forms, and then flows back into its unified Original Nature and ultimately into the unknowable (wuji). The West also sees Nature, or Creation, as the physical body of this Cosmos. But not everyone views Creation as a living, self-arising organism. Big Science says Nature is mostly dead (inorganic) matter. Big Religion says Nature is created by one or more deities, and that humans are at the low end of a hierarchical chain of beings that separates them from their creator. Intelligent Design theory is not Daoist—it is a God-based hierarchy, not a Qi-filled sphere-archy. 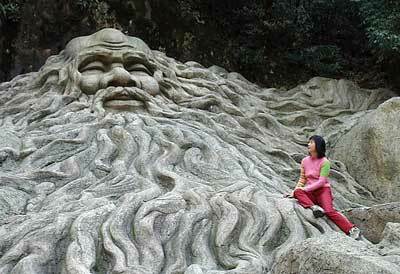 Giant stone carving of Lao Tzu. From verse 67 of his Tao Te Ching: With love one is fearless. But if one is fearless and has no love … surely they are doomed. Daoists view Creation - all material and spiritual forms, including humans - as made of the same Qi. Rather than a religious hier-archy of deity-beings, all Qi arises from the center of a "Qi sphere-archy." This unified intelligent energy field is called tai yi, the Great Oneness. Tai yi is not a Deity, but part of a higher process arising spontaneously from the "unknowable openness" of wuji. Tai yi's Qi is called Original Breath (Yuan Qi) because it is the first breath from source to exhale, eventually condensing as the yin-yang pulsating matrix of Space, Time, and Beings. But an infinite ocean of Yuan Qi still remains. Original Breath is both immanent and transcendent. It's present everywhere, not only in a far away heaven. We breathe it, eat it, bathe in it, even though its ultra-subtle non-polar essence is invisible to our yin-yang polarized physical senses. Great Oneness (tai yi) loves its self-creating process. Just as any parent loves their child, Dao loves Heaven, Earth, and Humanity as its own emanation, from the spiritual parent's Original Qi field. But until humans become more multi-dimensional in their awareness, it is difficult for them to perceive this cosmic Self-love except as the dim echo of their own emotional impulse to love something tangible. Nature is not a thing. It appears solid, but it's really vibrating energy. It's a living energetic process that is continuously birthed as the tangible love-child of the Dao. Evidence of Tai yi's Self-love is seen in its eternal willingness to sustain the body of Nature with unlimited Original Qi. All Qi is ultimately love flowing from source or flowing back to source. Put simply, Qi is love. Tai yi's nature as Pure-Love-of-the-Cosmos is the common root that unifies Daoist and Western thinking. Daoist cosmology holds that humans are a micro-cosmic reflection of Nature's macro-cosmic process. The self-arising of our bodies and local self-loving process of humans is a miniature version of the macro-cosmic Self-loving collective process of Nature. In alchemy, this is expressed as the famous maxim: As above, so below. Self-Love is the spiritual quality that saturates Original Qi flowing from source or Dao into everything that is birthed, from vast galaxies to tiny atoms. This Original Breath of the Dao is an undifferentiated (non-polarized) energy that Science calls Space. Space is originally neutral, but part of it becomes yin-yang polarized as it steps itself down into different dimensions of Creation. The rhythmic pulsation of yin-yang polarized Space we call Time. The feeling qualities embedded by Original Breath into Space-Time we call Consciousness, the field from which Beings arise. The fundamental quality imprinted into the Space-Time-Being matrix is Self-love. It is embedded into every atom, every molecule, every cell, all the simple tiny elemental group beings and every complex individual being. This love that source has for Space-Time-Beings is what causes everything in the cosmic matrix to want to "return to origin" (Lao Tzu's phrase in the Dao Te Ching). Even though all creatures on earth arise from the same source within the cosmic sphere-archy, humans are special: we're capable of a higher level of Self-love. Other animals, insects, fish, etc. are group beings and a part of the love-stream of Creation, but do not have a human soul's ability to evolve individually. Humans have a unique ability to be deeply Self-aware. We can express Nature's macro-cosmic Self-love on the local or micro-cosmic level because of our unique power of imagination. Thus birthing a human soul into a physical embryo is a very special act of cosmic Self-love. Our human souls are tiny sparks of pure non-polarized clear light arising within the primordial process. 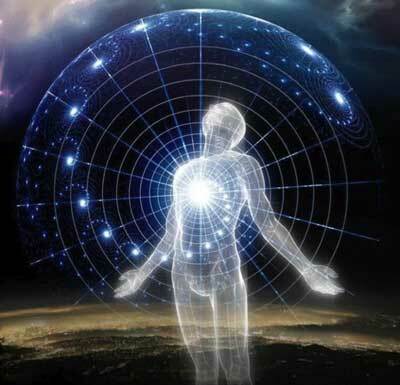 Each human soul spark carries the vibration of cosmic Self-Love as it descends into the physical plane, where matter and spirit are very polarized. A mother's womb space allows for the gradual transition from the formless into polarized form dimensions. But yin-yang polarization of soul into a body does not destroy our soul's memory of its non-polarized Original Qi. It merely hides our soul spark's Original Qi deep within our polarized human body-mind. Even our sexually polarized outer male or female body is sustained by this neutral soul spark of Self- love from source. It's important to understand the nature of Qi in Dao cosmology so that Western readers can grasp the difference between ordinary exercise that mechanically circulates the blood and tones the muscles, and Qi-based movements of tai chi-qigong. Both are called exercise, but their fundamental mechanism operates in different dimensions. This is why my introduction is titled as a "sacred movement that awakens Self-love." It's totally different from our normal unconscious body movements we use to navigate our daily lives. Qigong is better described as a "natural language," a way of speaking with Nature using bodily movement, rather than a category of Western bodily exercise. When I make a gathering movement in the heaven cycle of Wu Ji Gong, I am signaling to heaven that I want a particular frequency of its Qi that exists in the direction I am facing to flow into my body and into a particular energy center, deep channel or organ meridian. That particular Qi movement-as-communication may have secondary physical benefits of lowering blood pressure and improving muscle tone. But physical benefits are not the primary or highest reason for practicing Wu Ji Gong. When our spiritual heart opens fully, we connect directly with the cosmic flow of love and creativity. When we use Qi-based body movements to communicate, we are expanding our self-process far beyond the boundaries of our skin. Qigong can alter our biology, our psychology, and our spirituality simultaneously. When we stimulate one level of Qi, it is part of a web that affects other levels of Qi that in turn shape our relationship with the larger field of Nature. Equally important, Qi activates the inner relationship between our sensory body-mind and our intangible soul. Ordinary body-focused exercise is often used to merely push our body musculature to look firmer or perform a feat that in competition will outshine everyone else doing the same exercise or sport. The intangible aspect in sports of "mental focus" or "inner will" is in the Daoist view the application of Qi, although it is not named as such in the West. This outer-directed movement called exercise or sports may improve our self-esteem, but it doesn't necessarily give us a whole body-mind feeling of balance like qigong, or bring peace to our soul. We could call all sports or exercise a kind of movement ritual, but with a very different intent and effect than qigong, especially a cosmological qigong form. What axis does DNA's double helix spiral around? The yin-yang helix spirals around an invisible third axis. That axis is filled with our soul's Yuan Qi, which is a micro-cosm of the macro-axis linking the continuum of spirit-matter. This central axis is a super-information highway hidden within DNA and RNA. Wu Ji Gong helps open our body's core channel, allowing direct experience of this 3rd axial force. The vibration of Self-Love radiating from the heart of the Cosmos is embedded into our human body at the moment our soul enters the sperm-egg union. Our parents' love-making is a call to Source to renew its presence within Humanity. Our soul spark, riding a carrier wave of Yuan Qi, ignites the cellular multiplication we call conception. It means the feeling of Self-love is now downloaded by the soul spark into the DNA and RNA of a single physical cell, which divides and evolves to become a multi-celled body and personality with (in the Dao model) twelve vital organ body spirits. As our cells proliferate, our soul spark's vibrational frequency is imprinted within the nucleus of each new cell and coded into its DNA and RNA. 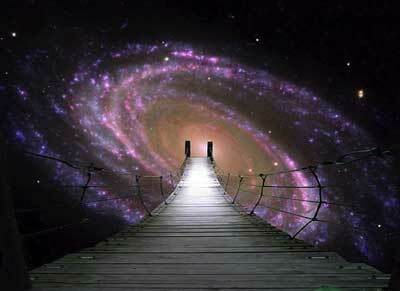 Our soul force is the invisible axis around which the double helix of our DNA spirals around. The core axis within our tiny loops of DNA is aligned with what Daoists call the Tai Chi (Taiji) pole. This is the cosmic axis around which Heaven-Earth and spirit-matter do a yin-yang spiral dance to sustain their perfect equilibrium, also in loops. Daoist micro-macro cosmic theory says humans are driven by the same spiraling cosmic forces that drive Creation. The Qi pulsing in the nucleus of each of our 80 trillion cells is directly linked to the pulsing Qi in the nucleus of the trillions of stars above. Editor's Comments: This article was taken from https://healingtaousa.com and is used with the author's permission. It is a part of his forthcoming Primordial Tai Chi: Way of Enlightened Self-Love…in 5 Bamboo Scrolls. The spelling of Tao, Taoist, Taoism, was changed to Dao, Daoist, Daoism, in accordance with the stylistic requirements of qi-encyclopedia.